George Hunt Pendleton was a prominent nineteenth-century lawyer, congressman, senator, and ambassador who played the central role in passing the Civil Service Act, also known as the Pendleton Act of 1883 (5 U.S.C.A. § 1101 et seq.). The Pendleton Act established a federal civil service system that was based on merit rather than on political patronage. Pendleton was born on July 29, 1825, in Cincinnati, Ohio. 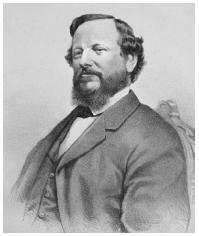 After his admission to the Ohio bar in 1847, he established a law practice in Cincinnati. He soon turned his attention toward politics. A lifelong member of the Democratic Party, Pendleton was elected to the Ohio Senate in 1853, where he served for two years. In 1857 he was elected to the U.S. House of Representatives, where he served until 1865. During the Civil War, Pendleton gained national prominence for his opposition to President Abraham Lincoln's suspension of Habeas Corpus and other wartime measures that restricted civil liberties. In 1864 he was the Democratic vice-presidential candidate, campaigning for peace between the North and the South on a ticket headed by Union General George B. McClellan. Lincoln and Vice President Andrew Johnson won reelection. After the war Pendleton became the leader of the greenbacker movement, which sought to redeem Civil War bonds in paper currency (greenbacks) instead of gold. His advocacy of this cause cost him the 1868 Democratic presidential nomination, because East Coast Democrats disagreed with the scheme. Pendleton did not reenter national politics until 1879, when he was elected to the U.S. Senate. By 1883 the federal government was plagued by inefficiency and corruption, most of which was attributed to the way federal employees were hired. Under the patronage system (also known as the "spoils system"), federal employees were hired and fired for political reasons. It was understood that presidents were entitled to reward political allies with cabinet posts, judge-ships, and diplomatic posts, but the spoils system extended to routine and low-level government workers. This created employee turnover when a president left office and the opposition party came into power. The 1881 assassination of President james garfield by a disappointed office seeker led to the passage of the Pendleton Act in 1883. The act, which created a federal Civil Service Commission that administered a merit-based, open selection process for hiring government employees, began the process of professionalizing the federal government. Politics and factors such as religion and nationality were to have no bearing on the hiring of civil servants. Although the act initially covered only about 10 percent of the jobs, subsequent legislation increased the percentage and it grew steadily. Pendleton's efforts at patronage reform cost him his Senate seat. Democratic leaders who preferred political patronage prevented his return to the Senate for a second term in 1885. President grover cleveland appointed Pendleton minister to Germany in that year. He served in this position until his death on November 24, 1889, in Brussels, Belgium. Case, H. Manley. 1986. "Federal Employee Job Rights: The Pendleton Act of 1883 to the Civil Service Reform Act of 1978." Howard Law Journal 29 (spring).